Explore the many great rivers and canals in PA. 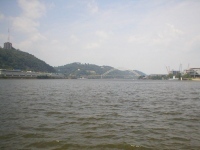 Enjoy fun river and canal trips in Pennsylvania. Peaceful, Varied and Full of History! Visit this historic canal and towpath that runs parallel to the Delaware River and enjoy the beautiful and diverse scenery along the way. Used in the 1800s as a convenient and easy means of transporting coal to major cities such as Philadelphia and New York City, this canal has remained virtually unchanged since it stopped being used regularly in 1931. One of the only continuously intact canals in PA! Along the banks of this National Historic Landmark, which also serves as a major migration corridor, you will see diverse species of fish and birds. A beautiful path in all seasons, the tow path runs for 60 miles and is open to hikers, cyclists and joggers. Fishing and canoeing are also popular activities along the canal. The 128 mile Schuylkill River runs through a plethora of national landmarks and historic places from Valley Forge to Philadelphia. This PA river was designated as a National Heritage Area in 2000 due to the significant role its people, places, and events played in history. Get a trail map and follow the river through sites from the American Revolution and the Industrial Revolution - learn about the history of America as you hike or drive. Biking, picnicking, and hiking are popular activities along the banks of the Schuylkill, while boating, paddling, and fishing take place in its tranquil waters. Whether you want to visit sites from the Industrial Revolution in Coal Country or Historic Philadelphia landmarks, the Schuylkill National Heritage Area encompasses a wealth of history. One of the Great Whitewater Rivers in Pennsylvania! The 109 mile long Lehigh River runs through this deep gorge creating waterfalls and rapids. 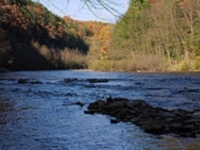 A popular place for whitewater rafting, canoeing, and kayaking, the Lehigh River has class II and III rapids through the gorge. Three river trips ranging from 8 to 20 miles can be taken by skillful boaters and guided trips are available for less experienced boaters. 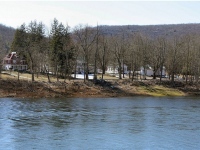 Fishing is another popular pasttime along the Lehigh River, in established areas. For those who would like to enjoy the river from the banks, 22 miles of hiking and biking trails are available on this wide and flat trail. 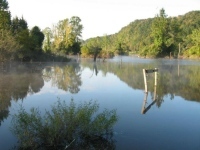 Beautiful and varied scenery can be seen along the banks along with a plethora of wildlife. Scenic River and Canal Trips in PA! This beautiful and tranquil river is a tributary of the Delaware River and runs 31 miles through Wayne and Pike Counties. A popular place for trout fishing and boating, the scenic meandering of the Lackawaxen runs through the beautiful Pocono Mountains. Birdwatchers regularly visit its banks in hopes of catching glimpses of the abundant Bald Eagles and other native birds. 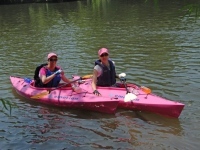 Regular events such as river towpath cleanups, and paddling trips are organized by the Lackawaxen River Conservancy in order to promote better care of the river and awareness of its importance to the surrounding areas. Point State Park is located at the confluence of the Allegheny, Ohio, and Monongahela Rivers and is rich with American history. Identified by General George Washington as an optimal site for a fort, this area of land at the triangulation of the rivers was an integral defense point during the French and Indian war. Visit the Fort Pitt Museum to learn about the French and Indian war and history of the Pittsburgh area before heading over to the Fort Pitt Blockhouse, Western PA's oldest architectural landmark. The park has many walkways, monuments and plaques so visitors can learn the historic importance of this river confluence. The park is also full of wildlife and thousands of native plants, making it a great place to sit in peace and tranquility for a break from the bustling city nearby. History, Recreation & Nature in Philly! 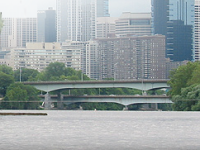 A 128-mile body of water, the Schuylkill River runs from Pennsylvania's coal country to Philadelphia. As the first city in North America to provide fresh drinking water to its citizens as a government service, Philadelphia's Watering Committee constructed the Fairmount Water Works along the banks of the beautiful Schuylkill River. Now used as a recreational resource for Philadelphia tourists and for those who call Philadelphia home, the Schuylkill River has transformed into a fun-filled attraction. If you're looking for a historical landmark, a recreational destination and a scenic spot in Philadelphia, then the Schuylkill River is definitely the place for you!